Representational photo of Nepal Parliament. The Communist Party of Nepal (CPN-UML) on Saturday has blamed the Nepali Congress for creating hurdles in the formation of a new democratic government in the Himalayan Nation. Former Prime Minister and CPN (UML) leader Madhav Kumar Nepal blamed the Nepali Congress of not allowing the left alliance to form the new government in the insurgency-ravaged country. The Left Alliance says it won 113 out of 165 parliamentary seats. The elections were held under Nepal’s new constitution adopted in September 2015. The elections will elect 275 members to the House of Representatives (HoR) and 550 representatives to the assemblies of the seven newly-created provinces. 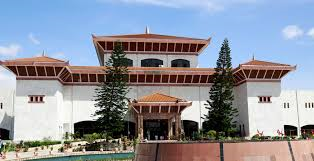 Nepal alleged the Nepali Congress was creating obstructions by raising the issues of ordinance on the formation of the National Assembly. “This is really bad. And they (Nepali Congress) should respect the verdict of the people,” the CPN (UML) leader said during an interaction with the locals of Sankhu in Kathmandu. The veteran communist leader said the left alliance will lead the new government, and will lead the nation to the path to prosperity. The alliance of Maoist former fighters and the other Communist parties registered a landslide victory in the general election. In the parliament, while 165 seats have been filled by direct elections, another 110 will be filled by proportional representation, for which separate ballots were used. At the provincial level, 330 posts have been filled through direct votes, and 220 members were nominated on the proportional representation basis. Both the House of Representatives and the provential assemblies will have 33 percent representation of women as mandated by the constitution.